To be kept informed of memorial service plans, please fill in your email address below. 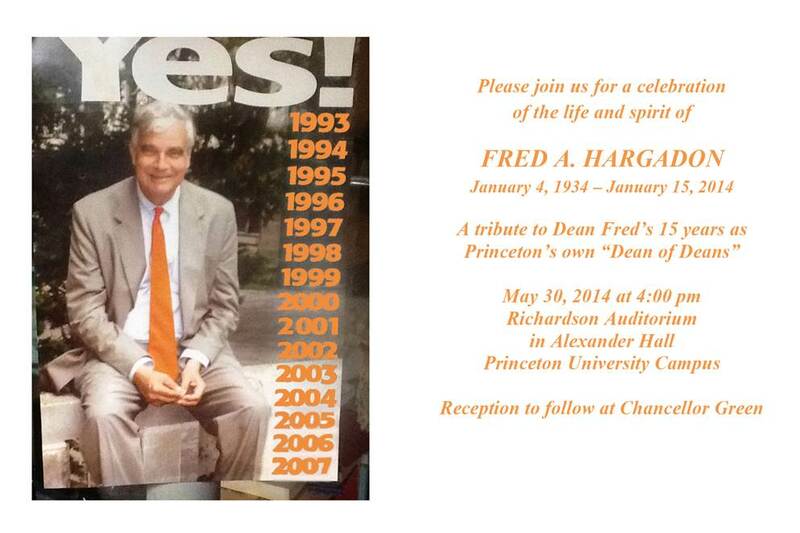 Fred’s memorial service for the Princeton community has just been announced and will take place Friday, May 30th, at Richardson Auditorium in Alexander Hall on the Princeton University campus. The service will be held in Richardson Auditorium at 4:00pm, and at 5pm there will be a reception at Chancellor Green (a 3 minute walk away). Richardson Auditorium is located in Alexander Hall (68, Nassau St, Princeton, Mercer, New Jersey 08542), just off Nassau Street. Princeton chose the date and time to coincide with P-rade, the Princeton reunion weekend, when the most students from Fred’s admitted classes would be on campus. This means it will be difficult (if not impossible) to find hotel accommodations or parking immediately nearby. For those who wish to attend but were not already planning to be at Princeton, we know this will make things a bit harder. There are no other public services planned for Fred at this time.